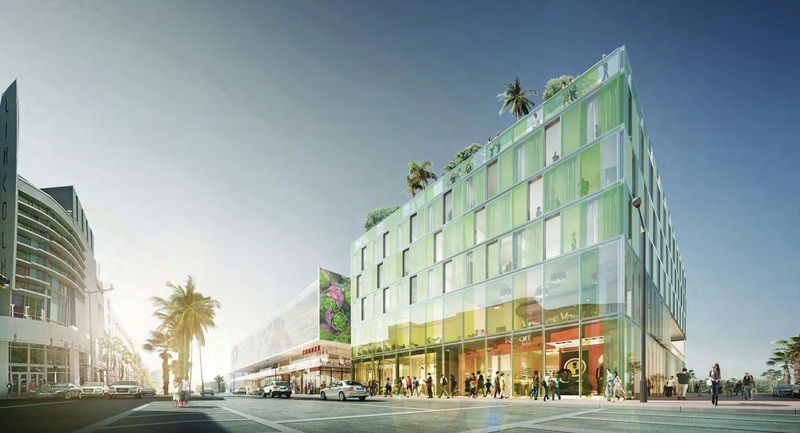 The Netherlands-based hotel chain Citizen M has signed on to operate a hotel at the 1212 Lincoln Road project, according to documents recently submitted to the City of Miami Beach. Crescent Heights, the developer, is requesting city approval to modify the project to include 168 hotel rooms, instead of the 100 previously approved. A variance will need to be approved by a city board to allow ultra-small rooms, sized at under 218 square feet, in order to accommodate the increased room count. The developer is also requesting approval to operate two large LED billboards. They will display graphics inspired in part by murals on the existing bank building at the site. The developer says they won’t put commercial ads on the electronic billboards, and they will attempt to preserve the murals during removal and display them elsewhere. Another change: previously, the developer had planned to demolish a structure at 1600 Alton Road, but they now say that existing leases make that impossible. Instead, they want to retain the building and reduce the project to two phases instead of three. The revised plans are set for review on October 3 by the Design Review Board. No thanks, LED billboards. Look no further than the MCM on the MacArthur Causeway and the visual pollution. They too said that no ads. Im fine with it so long as the billboards are faced to the east (down lincoln road) and north/south (alton road) those are commercial corridors and dont face any residential buildings., It works if they keep it relatively low in height. they blew it by calling it a “billboard”, which denotes the visual clutter we all think about with that word. should have called it “electronic mural” or something more pretentious. people see billboard and think of the palmetto or something. Citizen M is a very hip hotel! I just stayed there at CDG airport in Paris and it will be a great addition to South Beach. Not needing LED billboards though. Not crazy about the architecture but love the artistic aspect of the project. Great idea of the electronic mural and the fact they are trying to reuse the existing one. Definetly the responsible thing to do is to preserve that mural. It is great that they are trying to relate the ‘old’ with the ‘new’. Reusing the existing murals should be required. The queen palms instead of shade trees are embarrassing. Yes, replacing it with a video screen is an insult. Billboards? Billboards are visual pollution and LED billboards are the worst.